We received Grace’s 100bp PE NovaSeq (Illumian) RNAseq data from the Northwest Genomics Center today. FastQC analysis was run, followed by MultiQC. This entry was posted in Miscellaneous and tagged Chionoecetes bairdi, FASTQC, hemolymph, md5, multiqc, NovaSeq, RNAseq, tanner crab on 15 October, 2018 by kubu4. Previously concatenated and analyzed our Crassostrea virginica oil spill MBDseq data with FastQC. We decided to try improving things by running them through TrimGalore! to remove adapters and poor quality sequences. Processed the samples on Roadrunner (Apple Xserve; Ubuntu 16.04) using default TrimGalore! settings. After trimming, TrimGalore! output was summarized using MultiQC. Trimmed FastQ files were then analyzed with FastQC and followed up with MultiQC. Documented in Jupyter Notebook (see below). Overall, things look a bit better, but there are still some issues. Will likely eliminate sample 2112_lane_1_TGACCA from analysis and apply some additional sequence filtering, based on sequence length. This entry was posted in LSU C.virginica Oil Spill MBD BS Sequencing and tagged Crassostrea virginica, Eastern oyster, FASTQC, jupyter notebook, multiqc, TrimGalore!, trimming on 11 September, 2018 by kubu4. Per Steven’s request, I concatenated our Crassostrea virginica LSU oil spill MBDseq sequencing data and ran FastQC on the concatenated files. All commands were run on roadrunner (Apple Xserve; Ubuntu 16.04). See Jupyter notebook below for details. The concatenated gzip files and FastQC/MultiQC files are in the output folder linked below. This entry was posted in LSU C.virginica Oil Spill MBD BS Sequencing and tagged FASTQC, jupyter notebook, multiqc, roadrunner, Xserve on 10 September, 2018 by kubu4. I previously ran this data through the Bismark pipeline and followed up with MethylKit analysis. MethylKit analysis revealed an extremely low number of differentially methylated loci (DML), which seemed odd. Steven and I met to discuss and compare our different variations on the analysis and decided to try out different tweaks to evaluate how they affect analysis. 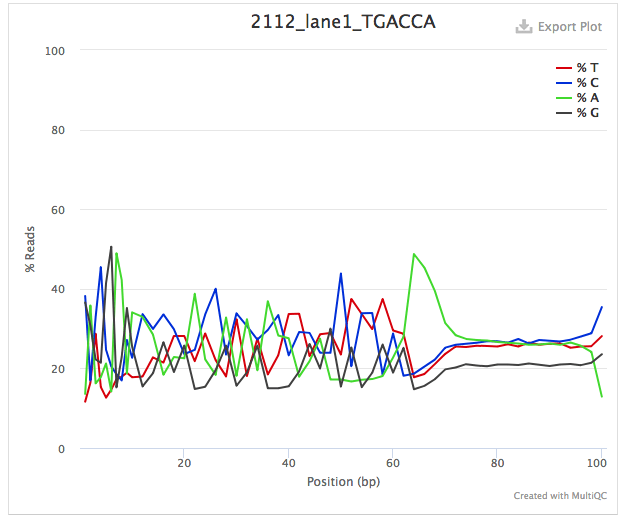 Looked at original sequence data quality with FastQC. Summarized FastQC analysis with MultiQC. Trimmed data using TrimGalore!, trimming 10bp from 5′ end of reads (8bp is recommended by Bismark docs). Summarized trimming stats with MultiQC. Looked at trimmed sequence quality with FastQC. This was run on the Univ. of Washington High Performance Computing (HPC) cluster, Mox. This entry was posted in Miscellaneous and tagged BSseq, FASTQC, mox, multiqc, olympia oyster, Ostrea lurida, TrimGalore!, trimming on 30 August, 2018 by kubu4. Earlier this week, I ran TrimGalore!, but set the trimming, incorrectly – due to a copy/paste mistake, as --non-directional, so I re-ran with the correct settings. Steven requested that I trim the Geoduck RRBS libraries that we have, in preparation to run them through Bismark. All analysis is documented in a Jupyter Notebook; see link below. Run TrimGalore! with --paired and --rrbs settings. Run FastQC and MultiQC on trimmed files. Copy all data to owl (see Results below for link). Confirm data integrity via MD5 checksums. This entry was posted in Miscellaneous and tagged BS-seq, FASTQC, geoduck, jupyter notebook, multiqc, Panopea generosa, roadrunner, RRBS, TrimGalore! on 16 May, 2018 by kubu4. Earlier today I finished trimming Hollie’s RRBS BS-seq FastQ data. However, the original files were never analyzed with FastQC, so I ran it on the original files. FastQC was run, followed by MultiQC. Analysis was run on Roadrunner. This entry was posted in Miscellaneous and tagged FASTQC, geoduck, jupyter notebook, multiqc, Panopea generosa, roadrunner, RRBS on 16 May, 2018 by kubu4. Copy EPI* FastQ files from owl/P_generosa to roadrunner. Run TrimGalore! with --paired, --rrbs, and --non-directional settings. This entry was posted in Miscellaneous and tagged bismark, BS-seq, FASTQC, geoduck, jupyter notebook, multiqc, Panopea generosa, roadrunner, RRBS, TrimGalore! on 16 May, 2018 by kubu4. Steven asked me to evaluate our methylation sequencing data sets for Olympia oyster. All computing was conducted on our Apple Xserve: emu. NOTE: The Jupyter Notebook linked above is very large in size. As such it will not render on GitHub. It will need to be downloaded to a computer that can run Jupyter Notebooks and viewed that way. Here’s a brief overview of what was done. Samples were trimmed with TrimGalore and then evaluated with FastQC. MultiQC was used to generate a nice visual summary report of all samples. This entry was posted in BS-seq Libraries for Genewiz, MBD Enrichment for Sequencing at ZymoResearch and tagged bismark, BS-seq, FASTQC, jupyter notebook, multiqc, olympia oyster, Ostrea lurida, TrimGalore!, trimming on 8 May, 2018 by kubu4. Steven found out that the Bismarck documentation (Bismarck is the bisulfite aligner we use in our BS-seq pipeline) suggests trimming 10bp from both the 5′ and 3′ ends. Since this is the next step in our pipeline, we figured we should probably just follow their recommendations! All data was copied to my folder on Owl. Checksums for FASTQ files were verified post-data transfer (data not shown). Hey! Look at that! Everything is much better! Thanks for the excellent documentation and suggestions, Bismarck! This entry was posted in Miscellaneous and tagged Crassostrea virginica, Eastern oyster, FASTQC, MBD-Seq, multiqc, TrimGalore!, ZymoResearch on 11 April, 2018 by kubu4. Earlier today, I ran TrimGalore/FastQC/MultiQC on the Crassostrea virginica MBD BS-seq data from ZymoResearch and hard trimmed the first 14bp from each read. Things looked better at the 5′ end, but the 3′ end of each of the READ1 seqs showed a wonky 2bp blip, so decided to trim that off. I ran TrimGalore (using the built-in FastQC option), with a hard trim of the last 2bp of each first read set that had previously had the 14bp hard trim and followed up with MultiQC for a summary of the FastQC reports. Well, this is a bit strange, but the 2bp trimming on the read 1s looks fine, but now the read 2s are weird in the same region! Regardless, while this was running, Steven found out that the Bismarck documentation (Bismarck is the bisulfite aligner we use in our BS-seq pipeline) suggests trimming 10bp from both the 5′ and 3′ ends. So, maybe this was all moot. I’ll go ahead and re-run this following the Bismark recommendations. This entry was posted in Miscellaneous and tagged Crassostrea virginica, Eastern oyster, FASTQC, MBD-Seq, multiqc, TrimGalore!, ZymoResearch on 10 April, 2018 by kubu4.